The northwest winds have subsided and have left us with an abundant supply of Chinook. The schools of herring have been moving inshore as well. With this the salmon have showed up in large numbers. 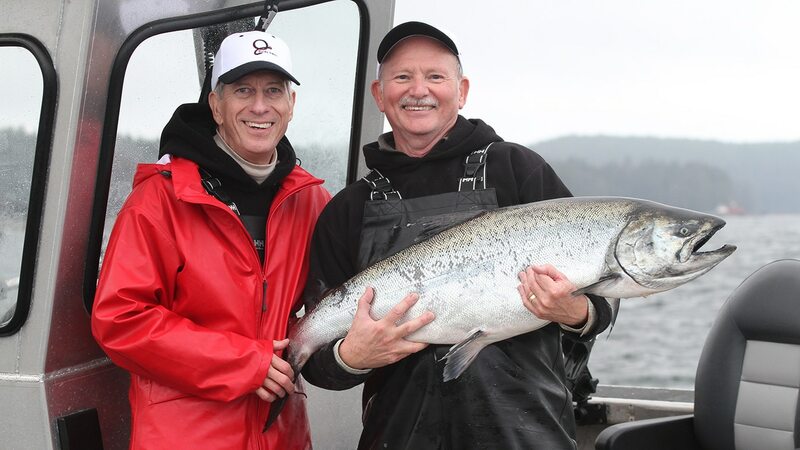 Deeper waters have been producing steady 14-25 pounder Chinook action as well as big Coho. The Chinook fishing these past 3 days has been unreal! With the Northwest winds you will usually have an influx of baitfish and salmon being blown into Cape Edenshaw. Because of this, we decided to go there today. It is always a gamble going to Edenshaw as it’s a little far from our western fishing grounds and If the fishing is not good it is a long run back to our western grounds. This proved to be a successful morning at Edenshaw as several large Chinooks were hooked throughout the fleet. We were doing laps by “Slab Rock” all morning, waiting for the Tyee bite. We had caught several fish in the high teens but were patiently waiting for the big one. It finally hit and the bite was so big the fish visibly moved the downrigger line as we heard a powerful “thud.” It was on, and we quickly cleared our lines and chased after this beast. After a nice fight that took us offshore we landed a beautiful fish. What a battle! 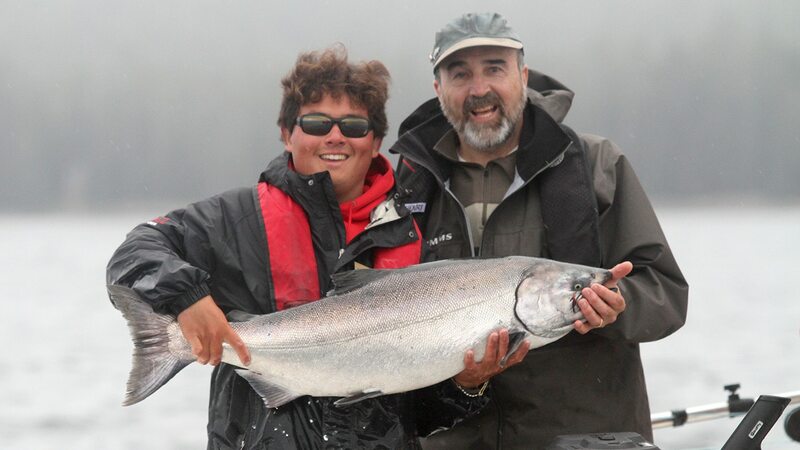 But it yielded a stunning 44 LB Chinook – ALRIGHT! There were a couple other large catches within the area we were fishing as well. What a day! Tomorrow, I think we’ll be back to Cape Naden where the action has been consistent. 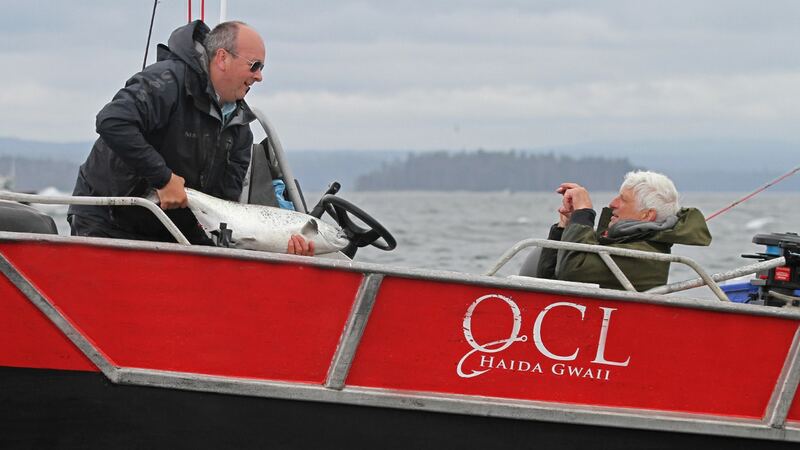 We want to fill up the Coho tags and the Coho bite has been consistent there. It’s great to see the fish showing up in large numbers and I’m looking forward to getting out there tomorrow morning! There is going to be calm waters with plenty of fish being caught by everybody.